An examination of the development of the Israeli military. published by Alfred A. Knopf. The preambles of the Rhodes armistice agreements [1949 agreements between Israel and Egypt, Syria, Lebanon, and Jordan that marked the end of Israel’s War of Independence] made impressive and encouraging reading. Each stated that it was designed to facilitate the transition from truce to permanent peace. Each endorsed the [United Nations] Security Council injunction against the use of force and affirmed Israel’s and the Arab nations’ rights to security and freedom from attack. For Israeli statesmen, nevertheless, future policy was to be dictated not by the sonorous verbalization of international documents, but by an acute awareness of the nation’s physical and diplomatic vulnerability. To begin with, Israel’s geographic position was a strategist’s nightmare. The newborn republic comprised less than 8,000 square miles. Its 600 miles of land frontier provided virtually no defense in territorial depth. Thus, three‑quarters of its population was impacted into the coastal plain between Haifa and Tel Aviv and along the narrow corridor leading to Jerusalem. Except for scattered outposts in the Negev Desert, no town or farm settlement lay more than 18 miles from an Arab border. 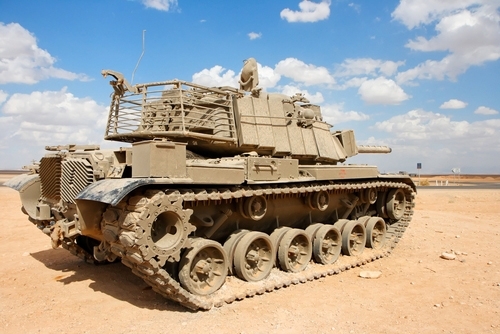 Israel’s “waist” measured scarcely 9 miles from the Transjordanian bulge to the Mediterranean. At points, the Jerusalem Corridor narrowed to a width of 10 miles, and the Israeli sector of the Holy City was flanked on three sides by Hashemite artillery. From the Golan Heights, Syrian guns were capable of wreaking havoc on the Jewish farm communities of eastern Galilee. Finally, access to Eilat, Israel’s southern gateway to Asia and Africa, was vulnerable to Egyptian maritime blockade. The entire country, in short, was a frontier, the only non‑island in the world that could be reached by sea alone (or by air over sea). The nation’s human resources were equally limited. The surrounding Arab populations outnumbered Israel’s population by forty to one, their standing armies by eight to one. Even within the framework of the armistice agreements, the Israeli government was suspicious of future understandings with neighbors that were traditionally volatile and mercurial. It was significant that during the first two decades of Israeli independence, the Arab nations underwent some twenty political revolutions, nearly all of them precipitated by army juntas. None of the successor military regimes dared adopt less than a hostile policy toward Israel for fear of losing popular support. It was a unique kind of hostility, moreover. It was not confined to one particular area of Israel’s life or territory, not directed toward a specific portion of Israel’s land, water, or mine resources. As the Israelis saw it, the Arab purpose was single‑minded and all‑absorptive. It was flatly committed to the destruction of Israel as an independent state. In girding its strength against this danger, too, the Jewish republic was limited by more than a paucity of territory, weapons, or citizens. It was deprived equally of friends and patrons. For Israel alone in the Middle East belonged to no defensive pact or political alliance whatever. Even the funds and diplomatic manpower it had available to explore and establish ties abroad were painfully meager. To be sure, Israel’s firstforeign minister, Moshe Sharett (formerly Shertok), a colleague of Ben‑Gurion’s since Second Aliyah days, was a man of uncommon brilliance and charm, and endowed with almost superhuman linguistic and negotiating skills. His closest associates, Reuven Shiloach and Walter Eytan, were similarly persons of unique dedication and imagination. But their personnel were under strength [limited]. As late as 1968, after twenty years of independence, only eight of Israel’s missions abroad possessed staffs of ten or more, while twelve missions were staffed by one person only, and the rest by three or fewer representatives. The perception of national vulnerability, then, remained the obsession of Israel’s leadership. Its one advantage for the government was political. National isolation ensured that at least in foreign policy the government enjoyed a reasonable freedom of action. In fact, the Knesset [Israeli parliament] played no direct role in foreign affairs at all, not even in the ratification of treaties. Parliamentary debates on international policy were useful mainly in contributions to public education, but these discussions rarely took place more than once a year. Although the foreign affairs committee met weekly, hearing testimony from ministers, diplomats, and army leaders, its sessions were executive, and those attending were pledged to secrecy. The committee’s membership unquestionably was of high quality, and enabled it to exert a certain intangible influence on foreign policy. Yet initiative and virtually complete freedom of decision in this area remained the prerogative of the cabinet. Hundreds of thousands of Jewish refugees from Europe and the Arab lands seek a new home in the Jewish state. An overview of the Jewish state and its many accomplishments and challenges.